Mehmed II (Ottoman Turkis: محمد ثانى‎, Meḥmed-i s̠ānī; Turkis: II. 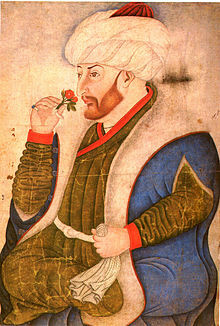 Mehmet Turkis pronunciation: [ˈmeh.met]; an aa kent as el-Fātiḥ, الفاتح, "the Conqueror" in Ottoman Turkis; in modren Turkis, Fatih Sultan Mehmet Han; an aa cried Mahomet II in early modren Europe), an aa kent as Muhammed bin Murad, Mehmed the Conqueror, Grand Turk, Kayser-i Rûm (Caesar o Rome) an Turcarum Imperator, an Fatih Sultan Mehmed (30 Mairch 1432 – 3 Mey 1481), wis an Ottoman sultan who ruled first for a short time frae August 1444 tae September 1446, an later frae Februar 1451 tae Mey 1481. ↑ Related to the Mahomet archaisms used for Mohammad. See Medieval Christian view of Muhammad for more information. This page wis last eeditit on 18 Dizember 2017, at 02:36.